An inspiring speaker, Dr. Atkins is committed to finding those ‘aha moments’ when mathematical connections are made by teachers and students. Sandy is passionate about helping all students understand mathematics. Her sessions are thought-provoking and practical. She is the author of Creating Fraction and Decimal AHAs and Creating a Language Rich Math Class. 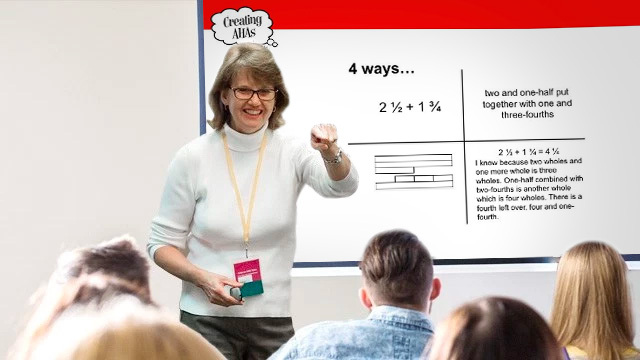 With particular interest in effective mathematics intervention, Sandy works closely with teachers across the United States to help them pinpoint student disconnects and close mathematical concept gaps. Dr. Atkins enjoys opportunities to provide keynote talks, workshops, seminars, and presentations. But her favorite professional learning activities involve building relationships with teachers through ongoing site-based projects that include getting into classrooms and learning from students. Sandy loves hearing, “Oh I get it! Why wasn’t I taught this way?” AHA!